The Double Featurette: Dispatches from the Tribeca Film Festival - "Theater of War" & "Children of Men"
Dispatches from the Tribeca Film Festival - "Theater of War" & "Children of Men"
The play was put on in 2006 and the film is just coming out this year, so both had to come to terms with creating art on war in a time of war. Walter's does not shirk this responsibility, showing the anti-war protests that happened during the plays rehearsal as well as drawing parallels between the Iraq War climate and the WWII climate that produced the original "Mother Courage." These parallels are not heavy handed (Speaking of which, Michael Moore was at the screening). Walter's antiwar slant comes out of Brecht's work (Mother Courage loses everything to the war) and the Public theater's production rather than out of his own ideology. It is refreshing to see a documentary that does not sidestep the fact that we are currently at war but also does not barge into the topic and preach to the audience. 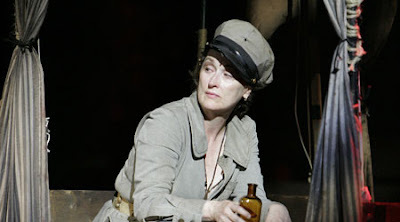 Nicole Kidman said famously after September 11th that art is important but Walters goes deeper and explores how art is necessarily changed by war (Streep, in one segment, discusses how being in the play is her way of dealing with her frustration about the war). Alphonso Cuarón "Children of Men" (2006) is another film that is closely tied to the current climate (note that it was released the year "Mother Courage" was performed). Cuarón wrote this film based on the novel of the same name by P.D. James and I think it is safe to assume that his interpretation of James' dystopia was affected by the way he sees the current state of the world (see video later in post). That is not to say that the film, divorced from its historical context could not stand on its own, but in our current climate, graphic images of bombs going off in coffee shops, overcrowded refuge camps and rampant distrust and imprisonment of immigrants hit particularly close to home. In fact, as great a film as I think "Children of Men" is, I do not think I can ever see it again. I have never been as shook up by a movie. It is not a film for the faint of heart. Of course, it takes place in a fictional time, in a world where children are no longer born. But once you accept that one difference: no children, the world of the film seems a little to real. There are moments when blood spatters the camera lens, our eye into the world. It is as if Cuarón is saying "YOU ARE HERE." If ever a movie could give you PTSD, this is the one. Though I do wonder about how much my own reaction is based on the times. Would a 1950's viewer or a viewer 50 years from now be as affected? If a director is responsible for understanding and the war around them and its affect on their art, how much are we, the viewer, responsible for being conscious of how the war affects our viewing? I normally just add video to give you a taste of the film, but the video above, which focuses on the cinematography of Emmanuel Lubezki discusses how he strove to make the war seem "real" using lighting, style and editing. "Fighter" (Natasha Arthy) 2007 : The Turkish "Bend it like Beckham". Predictable but fun. Very well filmed fight scenes, a treat for Kung Fu Fans. Congrats to Omar, a stuntman from the film who sat behind me at the screening.